The New Bigroom Progressive Electro House Club Banger! 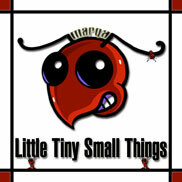 "Little Tiny Small Things" OUT NOW! The forthcoming release and latest instalment from Canadian DJ/Producer MarqA. Don't be fooled by the title, it's anything but. "Little Tiny Small Things" is a bigroom, progressive, electro, tech house banger clocking in at 128bpm and a sure fire hands in the air club stomper that's ready to take the club and festival dancefloors by storm.